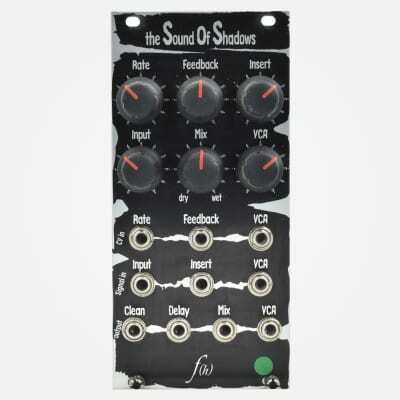 The Sound of Shadows (SoS) is a voltage-controlled (VC) digital delay module based around the PT2399 echo IC1 from Princeton Technology – which was, by the way, originally designed for Karaoke equipment. 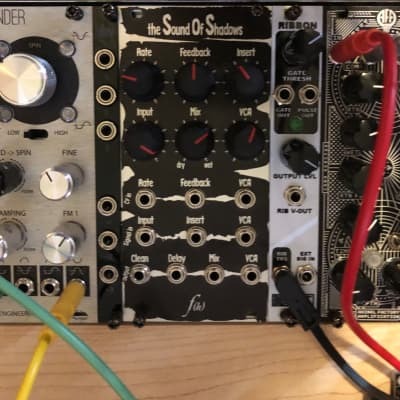 The SoS is essentially two separate modules: a delay and a voltage-controlled amplifier (VCA). The focus of the SoS was the delay while the VCA was thrown in because half of an LM13700 IC was unused, so the VCA is very basic. 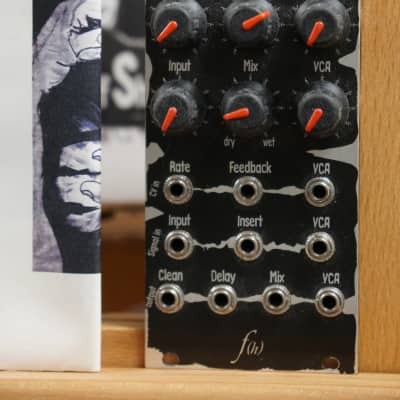 As with all f(h) products, the SoS was engineered towards maximizing functionality while keeping cost as low as possible. If some aspects of the unit seem awkward, it is most likely due to this. The goal is to make unique, useful, enjoyable, and affordable instruments, not just hoover2 out your bank account. And remember: every instrument has its quirks and unexpected aspects, so RTFM! All the way through! Specific quirks are mentioned in the description of the particular feature they apply to, so please read this through before emailing! This controls the delay clock rate, which in turn controls how fast the delay steps through its memory array and thusly the amount of delay. Clockwise rotation increases the rate (which decreases the delay time), counter-clockwise decreases the rate (which increases the delay time). Controls how much of the delayed signal is fed back into the delay cell. Feedback is what creates a reverberation or echo sound ? multiple repetitions of an acoustic event. Clockwise rotation increases the amount fed back, and thus the number of repeats, counter-clockwise decreases the amount. The nominal operating area is between 6:00 and 9:00 during normal usage. More than this will set up a self-propagating feedback cycle that will quickly get out of hand. This is the attenuator for the feedback loop insert jack. The jack is situated between the delay cell output and the feedback cell input. The feedback cell input is calibrated for the output of the delay cell, which is around 1.5Vp-p maximum, and most standard signals inserted here will overload the feedback cell unless attenuated, hence the Insert attenuator. Turn clockwise to increase the signal level, counter-clockwise to attenuate. When not using the Insert jack, it is recommended to keep this control turned fully clockwise, to the maximum position. Otherwise, you are attenuating the output of the delay cell, which will affect everything else further down the signal path. This is the input level control. Just like a volume knob ? clockwise increases level, counter-clockwise attenuates the signal level. Um, yeah. Guess what this controls? The balance of the mixed signal at the Mix output! Seriously, this controls the mix between the Clean and Delay signals at the Mix jack, really! This controls the VCA output level ? A.K.A. 4: the volume knob. Standard behavior with a minor quirk ? this control will not fully attenuate the output, but a negative CV applied to the VCA CV input will bring the level much further down. It was either this or add another IC associated components to the PCB and jack the price further up.